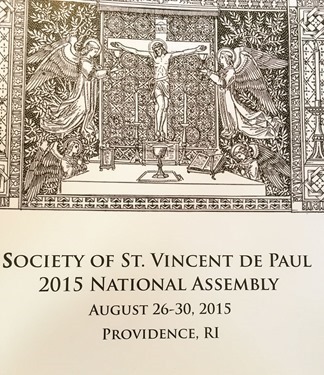 On Friday, I had the opportunity to celebrate Mass with the Society of St. Vincent de Paul of the United States at their Annual Assembly in Providence. Some 800 members of the Society from all over the United States came together to pray, learn, share, renew and plan for the future. The Society is present in 140 countries around the world with 172,000 members. We are fortunate to have 160 conferences in parishes throughout the Archdiocese of Boston with 4,100 members. The society in the archdiocese is led by Robert Travers, Jr. as their President. I have always loved the St. Vincent de Paul Society and admire their great spirituality and commitment to those in need. Without a doubt, the wonderful ministry of the Society of St. Vincent de Paul fulfills Pope Francis’ call to serve the poor. In caring for the poor, the vulnerable and disadvantaged, they are evangelizing in word and deed. The many works of charity they undertake embraces the love of Christ and leads those they serve to know and love the Lord. One of the international guests at the Assembly was Julien Spiewak. Julian is the International Secretary General of the Society. He is 29 years old with a fervent, dedicated and commitment to ensuring that the Society reaches out to the young. At the end of the Mass, members of the Saint Vincent DePaul Society renewed their commitment to the Society. There was a beautiful song performed, Vincentian Call to Serve. Lyrics were created by Raymond L. Sickinger, who is a Vincentian. 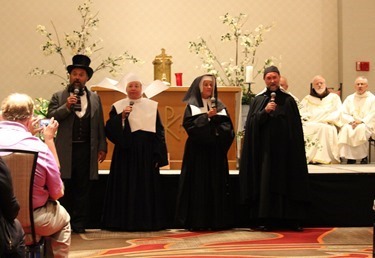 Singers portrayed Blessed Fredric Ozanam, Blessed Rosalie Rendu, St. Vincent de Paul and St. Louise de Marillac. The piece was composed to highlight the individuals who founded the Society. It is well worth a listen. As we are preparing for the Year of Mercy it is my hope that more and more people will become interested in participating in the St. Vincent de Paul Society in our parishes because theirs is a clear mission of mercy and the spirituality that is the underpinning of all our activities of charity. This is not something that is simply philanthropy or public service, but is born out of our vocation as Christians, as disciples of Jesus, and our sense of human dignity and connection to our brothers and sisters. I invite you to consider joining the Society to serve the needs of the poor throughout the Archdiocese. Contact your pastor or visit www.svdpboston.org for more information. 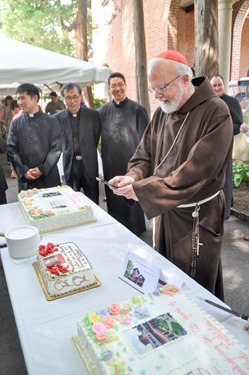 On Saturday I visited the Carmelites in Roxbury to join in their celebration the 125th anniversary of the Boston Carmel. Their chapel is extraordinarily beautiful and they told me it is one of the oldest Carmelite chapels in the country that has been in continuous use. In November of 1889, Boston Archbishop John J. Williams was in Baltimore to preside at the opening Mass of the Catholic Congress celebrating the Centennial of the Catholic Hierarchy in America. 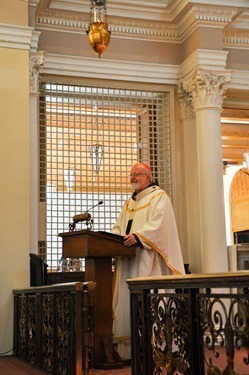 While in the city, he visited the Baltimore Carmel. There, he learned that the community had reached its full complement of twenty-one sisters and were having to turn away young women, many whom were from New England. 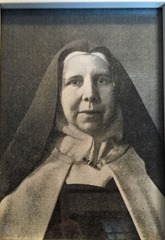 The nuns expressed their desire to establish a monastery in Boston, an idea immediately embraced by the Archbishop. Four days later, on August 27, 1890, they arrived and became the first contemplative order in Boston and the fourth Carmelite foundation in the United States. The following day the Holy Sacrifice of the Mass was celebrated in their convent, presided by Fr. Charles W. Currier, CSsR, a Redemptorist. The founding nuns stayed in their first location on Cedar St. in Roxbury for four years. On September 25th, 1894, they moved to our present location on Mount Pleasant Avenue. 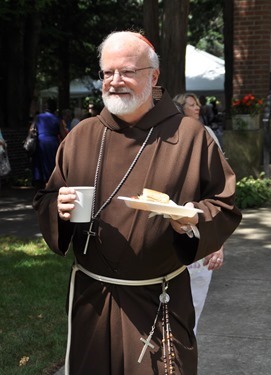 Several monasteries have been founded from Boston Carmel over the years, including those in Philadelphia, Pennsylvania; Santa Clara, California; Concord, New Hampshire; and Danvers, Massachusetts. 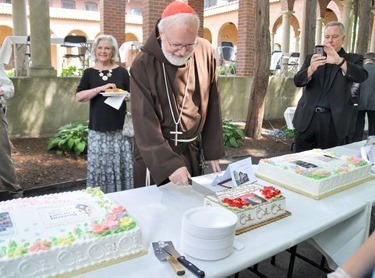 Many people came for the celebration and after the Mass, they invited everyone to join them for a luncheon in their beautiful gardens. 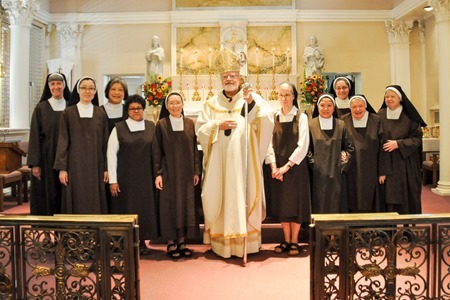 We are so blessed to have the Carmelite Sisters as one of the five contemplative communities in the archdiocese and the sisters are a very important presence in the Roxbury neighborhood. The presence of the contemplative sisters is such a powerful witness to the importance of the interior life. The sisters are a powerhouse of prayer, constantly praying for the needs of the Church and the world. That is one of the reasons the Catholic faithful appreciate them so much. 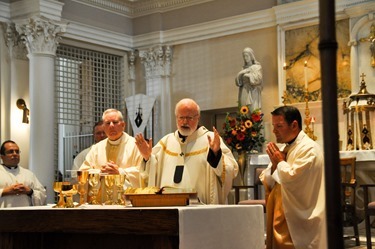 This week I celebrated the Mass of the Holy Spirit, the mass that traditionally marks the opening of the academic year, for our three seminaries that we are blessed to have in the archdiocese. Sunday, I celebrated the mass at Redemptoris Mater Seminary, Monday at St. John’s Seminary and earlier today at Pope St. John XXIII National Seminary. 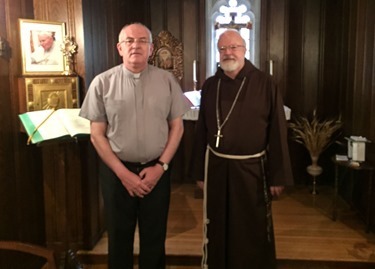 Recently I was visited by a priest working as a spiritual director at the Collegio Lombardo in Rome. He told me that the rector often warns the seminarians about the three lies of priests: the first is: “I don’t have any money.” The second is: “I will remember you in my prayers.” And the third is: “She’s my sister.” I am so glad that this is not a problem in Boston. But as we open the school year in our seminary, I want to assure you that the entire church is grateful for your willingness to discern the vocation to priestly ministry. Countless people are praying for you and for your vocation. Many benefactors make sacrifices to support the seminary because as faith filled Catholics, they realize how important your vocation is. As we begin this academic year, I once again urge you to use this time well to prepare yourself spiritually, intellectually and pastorally for your role of spiritual fatherhood in our church. Most of society’s ills can be traced to a breakdown in the family which is often characterized by the absence of the father. In the church we need men who are zealous and generous and willing to be a spiritual father, making the pastoral love of the Good Shepherd visible and present to God’s people. Today, I would like to talk about the priest as a man of hospitality. I believe this scriptural concept captures many of the themes that Pope Francis speaks about when he challenges us to go to the periphery, to practice the art of accompaniment, and to promote a culture of encounter. Throughout salvation history hospitality beginning in the book of Genesis is considered a sacred duty and responsibility of those who wish to be God’s people. As priests, we must be men of hospitality. First of all, we must open our hearts to Christ. In the book of revelations we read that beautiful phrase: “Behold, I stand at the door and knock. If anyone hears my voice and opens the door, I will enter his house and dine with him and he with me.” We must listen and hear the knock on the door of our hearts. Today’s Gospel describes a family that has lovingly opened their door to Christ at Bethany to offer him hospitality. Martha becomes so caught up in her frenzied activities of preparing a meal that she has lost sight of the opportunity to truly receive Christ into her heart. Her sister Mary has taken the time to listen to the Lord knocking at the door of her heart. They say that in Luke’s Gospel and Acts, there are 100 references to food and drink. Many of these references revolve around hospitality. In Luke’s gospel, when the disciples on the road to Emmaus encountered a stranger, they offer him hospitality. The author of Hebrews says that sometimes people entertain Angels without even suspecting. Jesus has told us that when we are kind and loving to the hungry, to the sick, to the stranger, we are actually serving him. When the disciples and Jesus arrived at Emmaus, Luke includes a very significant line in the Gospel. He said that Jesus made as if he were going to continue on his journey. The disciples then insisted that Jesus come to have supper with them. Had they said: “Nice talking to you. So long”, this gospel would never have been written. Jesus wants to be invited into our lives and into our hearts. Being a man of hospitality is then first of all, opening our lives to the Lord, and inviting him to enter in and dine with us. As in the Gospel, Jesus often arrives as a guest, but very quickly becomes the host. When Jesus is in our hearts and our minds, then our actions can correspond to his desires and his plan. To be able to open our hearts to the Lord, we must be men of prayer, we must be committed to the interior life. The disciples on the road to Emmaus were hungry for the Word of God, they talked about Jesus, they offered hospitality to a stranger and all of this prepared them to receive the risen Lord into their lives. A priest must be a man of hospitality to God’s people. We must make people feel at home in the church. We are being a man of hospitality when we receive new Christians in baptism. We are being men of hospitality when we receive the prodigal son in the sacrament of confession. We are men of hospitality when we are willing to leave the 99 behind in pursuit of the one lost sheep, because the lost sheep is Christ’s priority. The theologian Hans Urs von Baltazar says: “We apprehend first the beautiful and perceive that it is good and then, finally that it is true. Often it seems we try to start with the truth and never get beyond. Preparation for and reception of a sacrament should be a rich and glorious celebration of the presence of grace, a presence that would be reflected in the gracefulness of the parish staff. 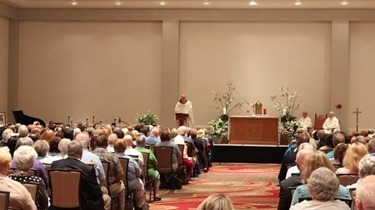 One author has suggested that parish staff and priest ought to have a course from the people who administer the Four Seasons Hotel chain on how to be friendly and attractive to the people they welcome to the sacraments. As it is now, he says, it often seems that they have been trained by the US Postal Service. At every level Church leaders and teachers should realize that beauty by which goodness and truth are most attractively presented, is their strongest tool, and today perhaps especially, the only really effective weapon for drawing the faithful closer to the Church and to God. Hospitality is part of the way that we express God’s loving invitation to a life of discipleship and community. As we prepare to launch a Jubilee Year of Mercy, we must rededicate ourselves to being men of hospitality. Jesus urges us: “When you give a banquet invite the poor, the cripple, the lame and the blind, and you will be blessed.” Our blessedness depends on our willingness to live the hospitality of the Gospel, especially in our willingness to reach out to the poor, the sick, the sinner and the rejected: they are the protagonists in the Gospels, they are the object of Jesus’ pastoral love. 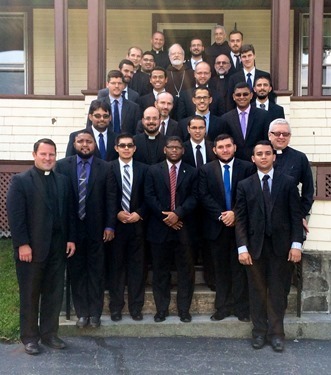 A priest must be a man of hospitality to his brother priests so that there can be an intentional presbyterate, a true fraternity, where we care for each other and support each other; where our concern for one another allows us to make fraternal correction, and where we are always ready to welcome brother priests. As priests and seminarians, we must be the welcome mat for all of those who are considering the possibility of entering the seminary. 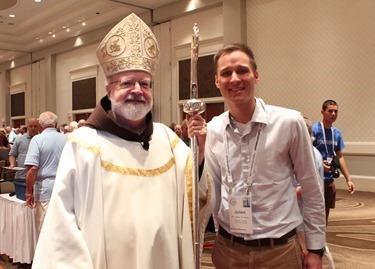 The whole Church has a grave obligation to promote vocations, but priests and seminarians have a unique capacity and responsibility to be vocation promoters. Hospitality also means promoting unity so that the Church will always be a family of disciples, that we will always be brothers and sisters even when we are not twins. Jesus’ prayer for unity is first of all for unity among his disciples. “Father that all might be one as you and I are one so that the world might believe that you sent me.” There is nothing more poisonous to the task of evangelization than the divisions in the Church. Being a man of hospitality means being a healer, a promoter of peace and unity. We live in a society that is very polarized; as priests we need to look for ways to build bridges and draw people closer to Christ so that they will become closer to one another. The Catholic Voices’ new apologetics is captured in the title of Austin Ivories’ book: How to defend the faith without raising your voice. 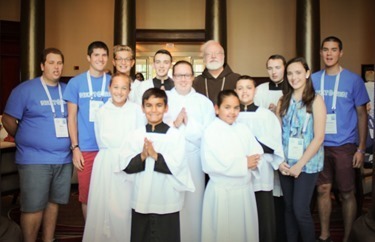 As I often remind our priests in our Archdiocese, we have the youngest population in the country. Likewise one third of the population of Boston are immigrants. Both of these groups present a challenge and an opportunity. They need to feel welcomed. They need priests who are men of hospitality, sometimes it will mean learning another language, learning about youth culture. Christ comes into the world as a stranger, as a pilgrim, seeking hospitality. To those who accept Him, to those who give Him hospitality Jesus becomes our host. As priests, the center of our life is the Eucharistic banquet where Jesus gathers us around himself and makes a gift of himself to us. The Eucharist is real when it is preceded by the washing of the feet and the New Commandment of mutual love and service. Then the Eucharist is the summit and the source of our entire life. As men of hospitality we must be tireless in leading people to the Eucharist. As celebrants and liturgical leaders we must work tirelessly so that the celebration of the Sunday Mass will allow people to glimpse the beauty and the joy of the heavenly liturgy. Being a man of hospitality is being nurtured by Eucharistic Adoration, by being like Mary at Bethany, at Jesus’ feet. The contemplative dimension of a priest’s life is what transforms his ministry and prevents it from becoming a hollow activism. We will be truly men of hospitality only when we have opened our hearts to Christ who is always waiting to be invited. As St. Paul urges us in the passage from Romans that we listen to today: “Contribute to the needs of the holy ones, exercise hospitality.” St. Paul goes on to tell us that that hospitality involves empathy and compassion: “Rejoice with those who rejoice, weep with those who weep. Have the same regard for one another, do not be haughty but associate with the lowly. The communities that Dorothy Day founded with the Catholic workers were called houses of hospitality. We hope that our seminary will truly be a house of hospitality, open and welcoming to all who visit here. We hope that these houses of hospitality will equip future priests to be men of hospitality, constantly inviting Christ into their lives and looking for ways to share Christ’s love with others. Also this week, I had a number of people come to pay a visit. The first was Bishop Kindane Yebio from the Diocese of Keren, Eritrea, who is visiting the Ge’ez Rite community that worships at the Cathedral of the Holy Cross. This community is made up of Ethiopians and Eritreans who belong to the same Eastern rite of the Catholic Church and participate in the community there under the pastoral care of Father Abayneh Gebremichael. Also, Father Jack Olivera accompanied the Auxiliary Bishop of Braga, Portugal, Bishop Francisco Senra Coelho, who came for a visit. He was in Fall River for the Grandes Festas do Divino Espirito Santo and Father Olivera brought him up to show him the Cathedral and greet me. 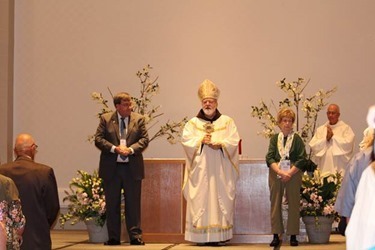 Bishop Coelho is the Episcopal moderator for the Cursillo Movement in Portugal and was very involved in promoting Cursillo for the Portuguese speaking community here in New England. Pope Francis has given the Church and the world a great gift in his announcement of Jubilee Year of Mercy that will begin December 8, the Solemnity of the Immaculate Conception, continuing through to the Solemnity of Christ the King in November of 2016. The Holy Father today shared that there will be many occasions for the faithful to experience the graces of the Year for Mercy, including those who are confined at home or at a medical facility and those who are incarcerated. Recognizing the seriousness of the sin of abortion and the implications this can have for those involved, Pope Francis is making particular outreach to women, noting that many women were under great pressure and felt that they had no choice. Under the provisions of canon law, absolution of certain serious sins, including abortion, was reserved to the diocesan bishop. 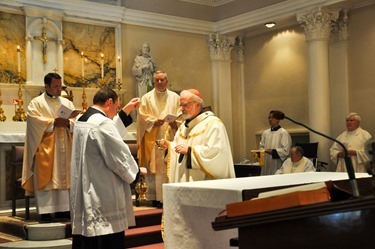 For many years in the United States, including in the Archdiocese of Boston, diocesan bishops have granted their priests the faculty to absolve the sin of abortion. As part of the outreach of the Year of Mercy, the Holy Father will now grant all priests worldwide the faculty “to absolve of the sin of abortion those who have procured it and who, with contrite heart, seek forgiveness for it.” His words acknowledge the reality of God’s abiding mercy in the Sacrament of Penance, and that God welcomes all with open arms. My hope and prayer is that all those carrying the burden of an experience of abortion would turn to the Church and her sacraments and experience the Lord’s mercy and love. Wherever a person might be in their healing journey, please know that in the Archdiocese of Boston and most dioceses in the United States, Project Rachel and other post-abortion healing ministries offer a compassionate and understanding pathway to renewal. To find the nearest diocesan healing ministry, go to the “Find Help” map at www.hopeafterabortion.com or www.esperanzaposaborto.com.